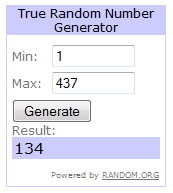 Patches of Pink: Create a Critter Cartridge Winner!!! Create a Critter Cartridge Winner!!! First, I just want to say THANK YOU to all of you for helping my blog to grow so much! I have loved reading all your sweet comments and all the wonderful blogs I have been introduced to! You all have just been so great and I love it that you love my stuff! Posting on FB and my fave critter is the skunk! Thanks again! Keep an eye out everyone! There are more giveaway to come in the upcoming months and year!! What might they be you ask? Congrats Dandylicious. You won a great prize. The rest of us will just have to watch for the next goodies and enjoy all the great projects posted for us to see in the meantime.